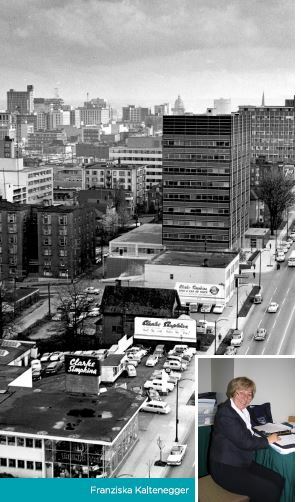 International Conference Services Ltd. (ICS) was established in 1976 in Vancouver, Canada, and 2016 marked our 40th Anniversary in the events industry. To celebrate this, we created a 40th Anniversary Photobook, which highlights some of our favourite memories and major milestones that we have achieved throughout the years. Over the next few months, we will be releasing these 40 stories on our website and on social media.These stories are not only a celebration of the past 40 years and all that has been accomplished, but also a commemoration of all of the hard work and dedication (and let's not forget fun!) that our entire team has been a part of since the beginning. To everyone who is and has been a part of our ICS family - our clients, suppliers and our internal team - Thank You for coming along this journey with us and here's to the next 40 years! 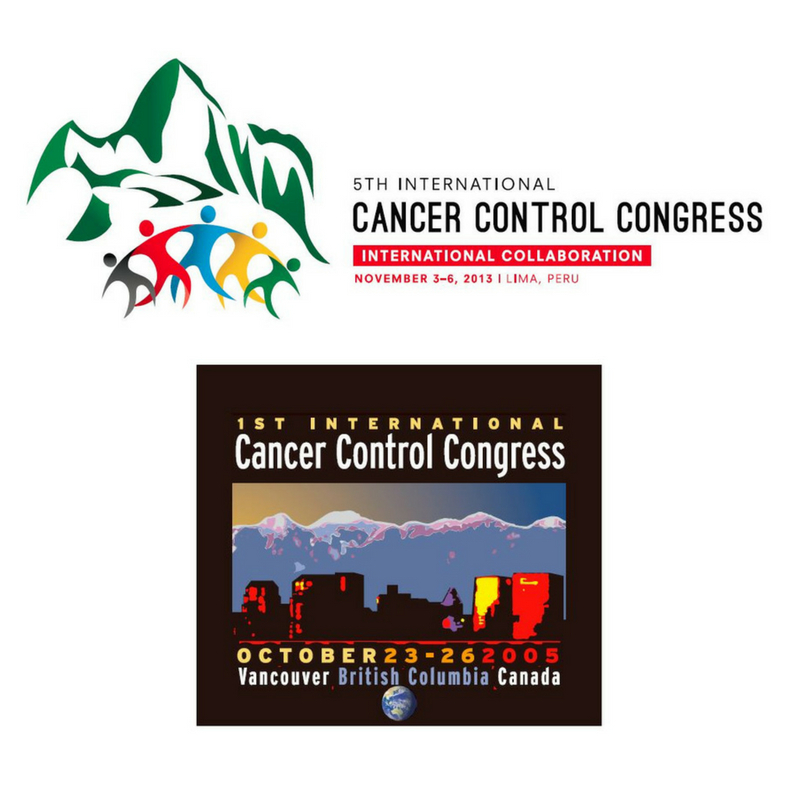 In 2003, ICS partnered with Dr. Simon Sutcliffe and Dr. Kavita Sarwal to start a new conference which would eventually have its first edition in Vancouver in 2005: The International Cancer Control Congress (ICCC). As with many first time events, one ever knows how things will turn out but it was proven that the strong determination by various individuals and a worthy cause can lead to everything. Needless to say, The Vancouver Congress was a great success and therefore the ICCC continued, being managed in Brazil in 2007, in Italy in 2009, in Korea in 2001 and in Peru in 2013. 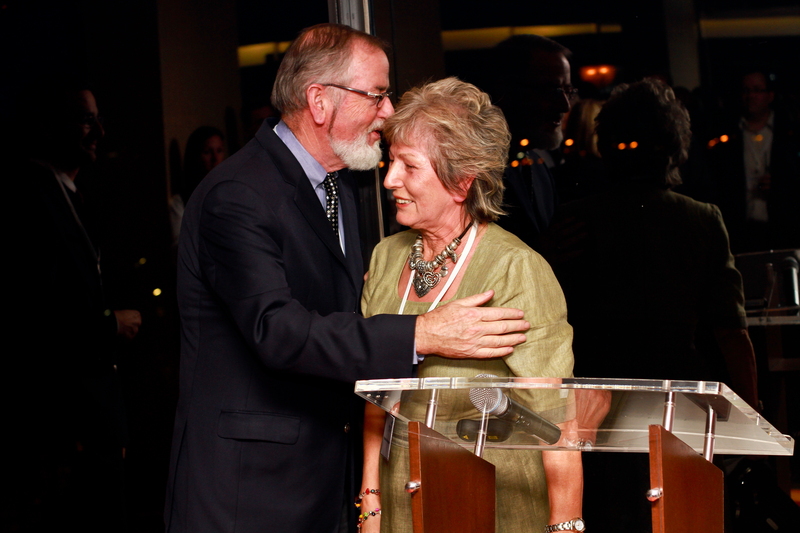 Wherever ICCC went, it left behind a lasting legacy that changed the way Cancer Centers around the globe collaborate. For ICS, ICCC was always a special congress - first of all it was the first congress ICS got to "start up" with clients and then accompany it around the world but most importantly it was a congress that we managed with friends, overcoming many challenges - and taking home lovely memories from each destination. Due to the ICCC, there have been many initiatives in Cancer Control around the globe - especially in Latin America and Dr. Simon Sutcliffee is still involved in some of them. It might be one of the oldest instruments in the world, but in July 2011, the Harp brought out a number of new ideas for ICS. Together with the Local Organizing Committee and under the guidance of Congress Chair Elizabeth Volpe-Bligh, ICS had to get very creative to host over 800 of the World's best harpists in Vancouver. 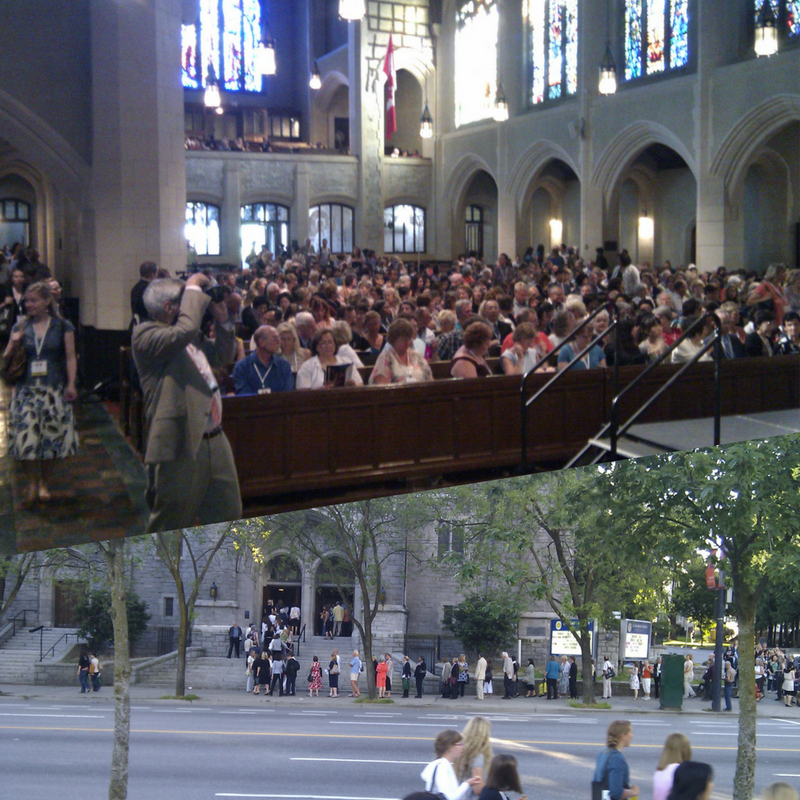 The Sheraton Wall Centre, which was hosting the World Harp Congress (and simultaneously a Human Rights Conference ICS was organizing), did not have enough space so we decided to move the Plenaries across the street into the beautiful St. Andrew's Wesley Church. This proved to be a lovely environment to play the harp. To make sure the expensive harps that were brought in could be played in the best possible acoustic environment, we rented a number of venues around Granville Street, but that meant rolling all these harps on the sidewalk from the Sheraton to Granville Street and back- which was a special attraction for Many Vancouverites to see! The World Harp Congress was a great success for ICS and the International Association. In fact, the Facebook Group that was established for the congress back then is still extremely active even today, leading to a virtual legacy for the congress. Over the years, our team has grown with the addition of some of our youngest and cutest team members. 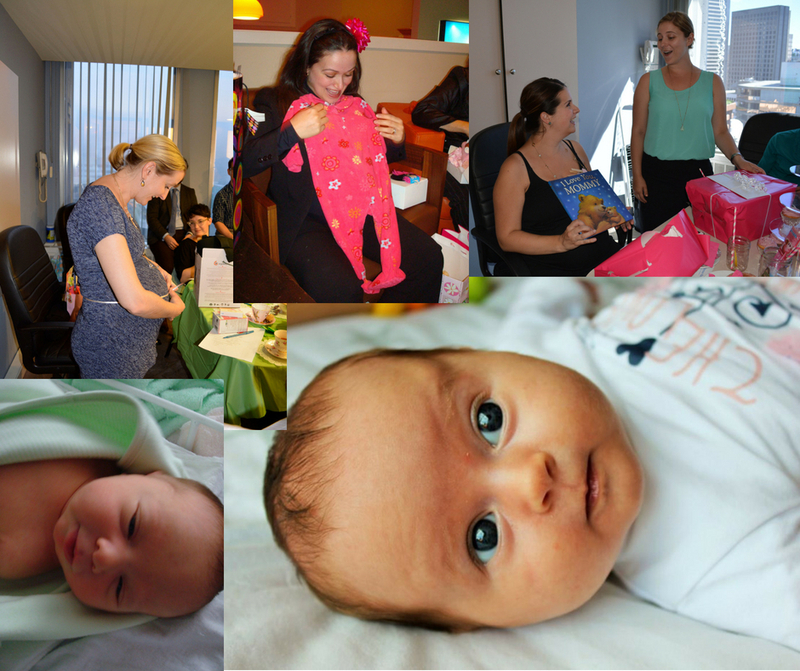 We've had many baby showers in the office throughout the years to celebrate mommy and welcome the babies. Here are a few picture highlights! In 2016, ICS merged its European operations with London-based Judy Lane Consulting (JLC). JLC has a stellar international reputation as being an expert when it comes to Legal Conferences and has managed countless prestigious conferences such as the World Congress of the International Bar Association which welcomes more than 6,000 delegates every year. ICS and JLC share key business values ensuring a seamless merger. Both have strong reputations for delivering "boutique-style" service highlighted by personalization, flexibility and direct access to leadership for their clients. Additionally, both companies believe exceptional employees are the foundation of their success. Aside from experienced conference managers, the companies also have team members with senior-level association management experience. The merger is expected to strengthen ICS' foothold in the European market. 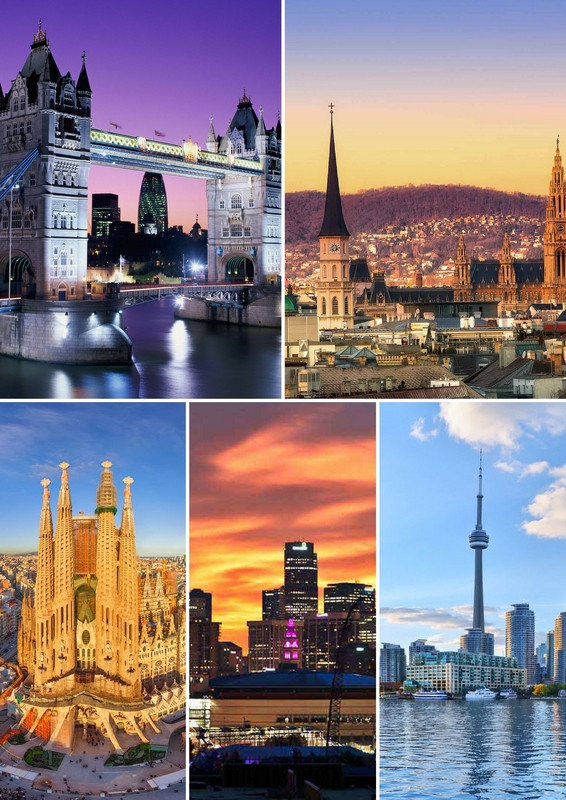 JLC's offices in London and Barcelona complements ICS' office in Vienna and are key strategic locations for professional conference organizers. 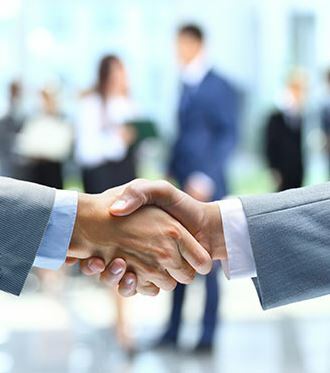 JLC and ICS are leaders in international conference and association management and the partnership is expected to produce outstanding benefits for each organization's existing and future clients. ICS is pleased to partner with JLC and work towards future prosperity for both teams. On Monday, May 2, 2016, the Leicester City Football Club (known as the Foxes), overcame 5,000-to-one odds to become English Premier League Champions for the first time in club history. Hometown supporters of Leicester City included conference co-chairs David Waller and Dean Fennell, and multiple members of the iMig 2016 Local Organizing Committee (LOC). Leicester City made its return to the Premier League in 2014, after capping nine seasons in the lower Football League Championship with a division title. Winning the Premier League - Leicester's first top-level football championship - is considered by many newspapers the greatest sporting upset of all time. Multiple bookmakers had never paid out at such long odds for any sport. Throughout Leicester's history, they have spent all but one season within the top two tiers of English football. On the day Leicester City F.C. won the Premier League, ICS was hosting the iMig President's Dinner at the Birmingham Town Hall. At the end of the evening, various LOC members requested to turn on the radio to follow the last minutes of the deciding game. Loud cheers erupted after it was clear that Leicester was victorious. 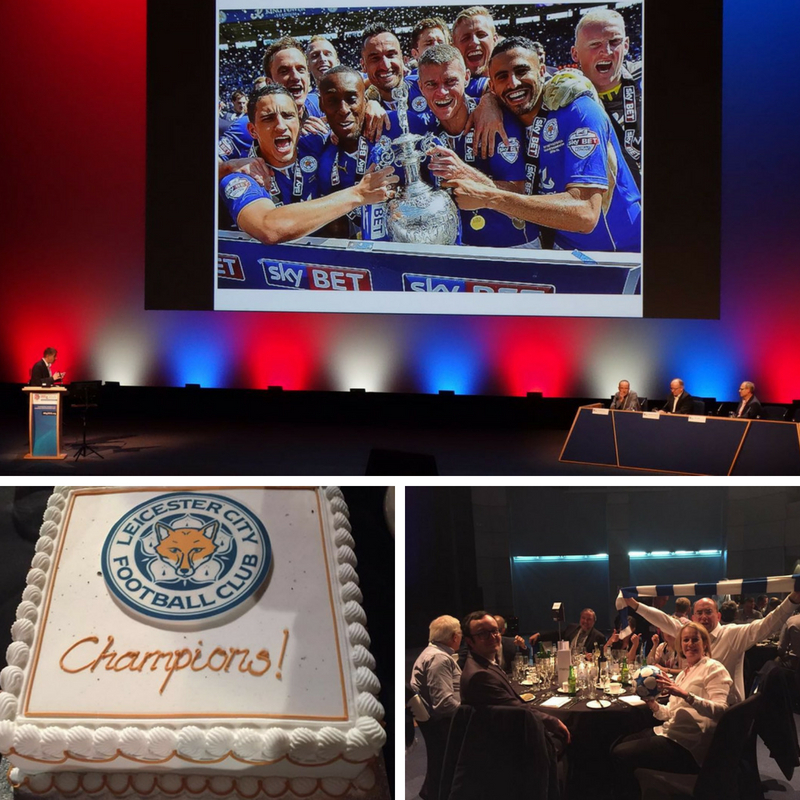 The next day, the ICS team decorated the LOC's gala dinner table with Leicester City F.C. colours. Chairs were dressed with blue and white scarves, the table was decorated with blue and white soccer balls, and a custom Leicester City F.C. Champions cake was served for dessert. The last-minute arrangements complemented an excellent event, and groundbreaking accomplishment for Leicester City. Mathias was first elected to the IAPCO Council in February 2010 and has since managed several portfolios. Since 2012, he has been a member of the IAPCO Training Academy Faculty. In February, 2016, he was appointed as IAPCO Vice President after a unanimous vote (since this article was originally written, Mathias is now President). Mathias continues to spearhead IAPCO initiatives to promote industry best practices. He is a strong advocate of quality assurance, and works with colleagues and competitors alike to advance the industry and ensure future Conference Managers are well prepared. Mathias also has speaking engagements around the globe to further educate the industry in regions outside of North America and Europe, including Asia, Africa and Latin America. Along with IAPCO, PCMA, The Professional Convention Management Association, is the leading association for education and innovation in the hospitality and events industry. PCMA Convening Leaders, is the flagship education event of the association which hosts more than 4,000 meeting planners and suppliers each January in different locations in North America. "It was amazing and completely overwhelming. I came back with so many ideas and with a renewed sense of energy and motivation and knew that I wanted to stay involved in the organization. A year later, I was asked to join the Board of the PCMA Canada West Chapter as Director of Education. In 2015, I took over as the President of the Chapter and am now in my second year as the Chapter President. I am looking forward to seeing the chapter grow and evolve, especially after Vancouver hosted one of the most successful Convening Leaders Conference yet, in January 2016." Our very own Annie Wong has become somewhat of a local celebrity in the beautiful city of Fernie, British Columbia! Annie, the Junior Conference Manager of the ISSW 2016 Conference, was chosen to provide comments and recommendations on the meeting place and lodging accommodations during a recent site visit held in Fernie, BC, for the ISSW 2020 bid. "Fernie is a small city with an international flair. Many of the local businesses, which I met during our site visit, were extremely excited and interested in supporting the hosting of ISSW 2020. This kind of support is imperative in providing sustainable growth for the city, as well as for its tourism industry". 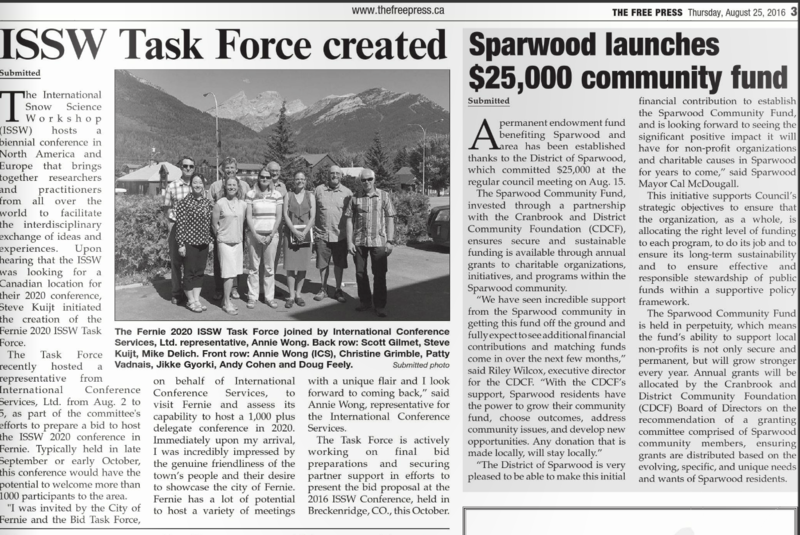 Annie obviously made a fantastic impression on the people of Fernie, as she, along with the ISSW 2020 bidding team, were made famous in the local Fernie newspaper. A huge congratulations are also now in order as Fernie has won the 2020 bid! ICS is now tasked with making sure that the town of Fernie can host a conference with more than 1,000 international delegates. To accommodate International Conference Service's rapid growth and future expansion plans, we relocated the office on March 1, 2016. 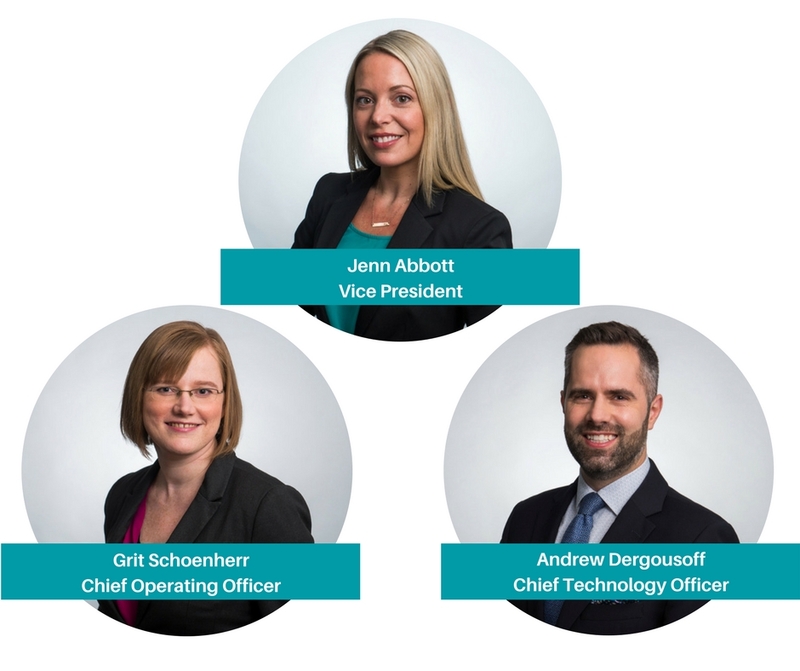 The new office on West Pender Street provides the capacity for increased client support, sales and operational services and leadership functions across the company. With only one month to organize everything including the purchase of new furniture and AV/IT equipment, renovating the old and new spaces as well as coming up with a completely new and unique design for the office brought even our best and most efficient planners to the edge of insanity! The new office space is a major component to our goal of establishing a significant shift within the company culture. As we grew in numbers at the old office, it became apparent that the lack of space was an inhibiting factor for most of the staff. With the new space, we looked at creating an open and individualized work environment with strong encouragement to connect and collaborate in any of the four different meeting spaces. Standing work environments, comfortable meeting spaces utilizing natural and work-friendly light, wood elements, inspirational messages and a welcoming reception area were just a few elements that created a new and invigorated energy within the office. To celebrate our 40 year anniversary in the industry, we decided it was time to revamp our corporate identity with a new logo. The talented Dave Venus, our Director of Marketing, designed our new logo, which now also features five brand colours, each of which represents a core service of our company. The goal of this new logo was not necessarily to rebrand ourselves, but rather refresh it. The ICS emblem (the rounded corner square with an upward arrow which has the meaning of "where we want to take you"), has become widely recognizable in the industry and we wanted to maintain this within our new look. All aspects of the rebranding were reviewed, including how the ICS teal colour would appear in print and on the web. We determined that it would be best to keep this favoured teal colour, but to perhaps make a slight shift into a richer and more modern version. The text and emblem were also brought more into alignment, which serves to create a powerful and renewed look to our brand, all while honouring its roots. 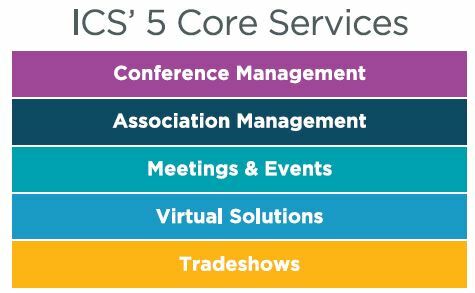 Five core services were established in the lead up to the logo redesign that International Conference Services provides throughout the industry. We wanted to visually represent these services so we took on the challenge of finding four supporting colours to the ICS teal that were unique, but also complemented each other. We believe that we found these four colours. Corporate Social Responsibility is a core value that we hold at ICS. Whether that be at home here in Vancouver, or around the world where we often travel for many of our events, giving back to those less fortunate is important to us. We would particularly like to thank our President, Mathias, for allowing many of our team to volunteer during the work week in order for us to contribute to so many wonderful charities. 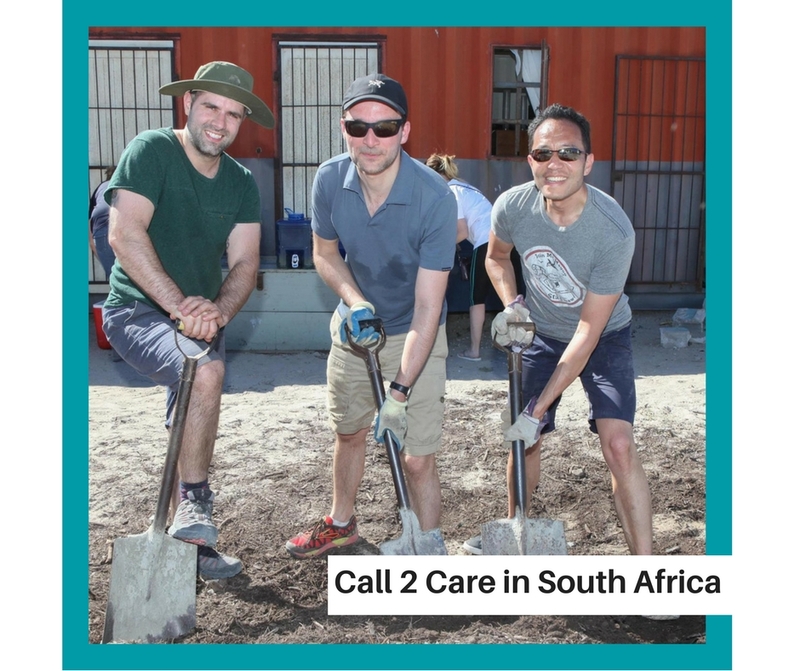 A few charities we would like to highlight include the Vancouver Food Bank, Clean Up Vancouver, the Christmas Bureau and a trip that Mathias and Andrew took to South Africa, for the IAPCO General Meeting where they visited the Call 2 Care Volunteer Organization. Every Friday, ICS team members have "casual Fridays", in which we can take a break from wearing the usual corporate uniform we so diligently wear throughout the week. In dressing down, each member brings in $2 for a charity that we have chosen to support (a different one each year). At the end of each year, ICS will match the total amount that was raised. ICS has participated in Keep Vancouver Spectacular for a number of years. Keep Vancouver Spectacular is a program all about keeping our city beautiful and making it an even better place to live, work and visit. Throughout the holidays, our team has participated in the Christmas Bureau. This is a fantastic charity which provides gifts for children and teenagers over the holidays. Our team has helped sort toys by age before the bureau sends them out to families in need over the holidays. While Mathias and Andrew were in South Africa, they helped to build food gardens for elders in the Samora Machel Township along with other IAPCO Meeting attendees. The APOLLO Project (Adaptive Patient Oriented Longitudinal Learning and Optimization) seeks to assist oncologists and accurately identify effective cancer treatments based on a patient's unique proteogenomic profile. APOLLO's first priority is tackling lung cancer. 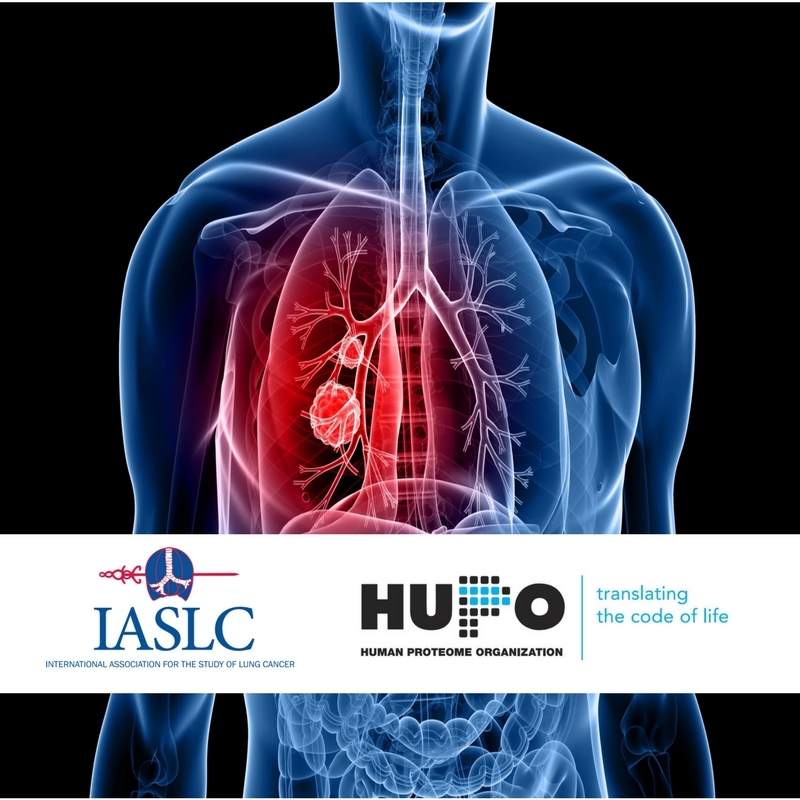 This created a unique partnership opportunity for two ICS long-term clients - The Human Proteome Organization (HUPO) and the International Association of the Study of Lung Cancer (IASLC). Both Organizations are global leaders in their respective fields. The IASLC World Conference on Lung Cancer has drawn an ICS record 7,000 delegates. Meanwhile, HUPO's 2015 World Congress was one of ICS' most memorable events highlighted by a Hockey Night in Canada (see previous post about this event!). ICNMD is a perfect example how teamwork and close collaboration between ICS and the Local Organizing Committee can lead to an extremely successful and memorable Congress. ICNMD Congress President Dr. Vera Bril played an essential role supporting ICS Sponsorship Manager Cali Vindeirinho in securing funds to support the Congress. 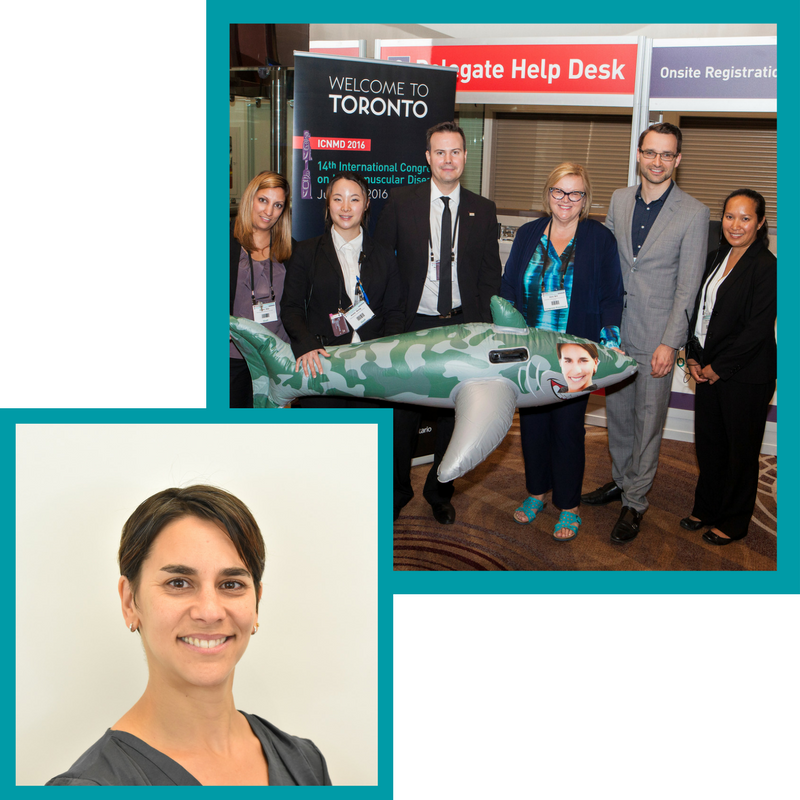 Although Cali had to leave Toronto before the end of the Congress, Dr. Bril ensured she made the final photograph with the ICS team. The inflatable shark with Cali's face made for a good laugh and a perfect end to the memorable event. "I am indebted to the Congress President and many of the LOC members for passing on very good contacts for the companies I was after. It made by job so much smoother", said Cali. "The 'Shark' story started in the Opening Ceremony when Dr. Bril was thanking members of the ICS team. She acknowledged my success and said that I had been a 'Shark' going after sponsors. It was said in a very nice way, meant to be a joke, and it stuck throughout the Congress!" ICS manages dinners and events for clients from all different backgrounds and professions. We always try to make it special and meet the tone of the meeting. The International Association of Relationship Researchers (IARR) Conference was held in Toronto in the summer of 2016. Historically the conference brought in 700 people and had always been run by a group of local volunteers who dedicated their time to bringing the event together locally. The Toronto Organizing committee chose to rewrite history by enlisting ICS to help plan and execute the 2016 conference. A great many decisions are made in the process of bringing a conference together on time and within budget. This includes centerpieces for the final gala dinner. Usually, these are made up of floral bouquets which can be a costly option. 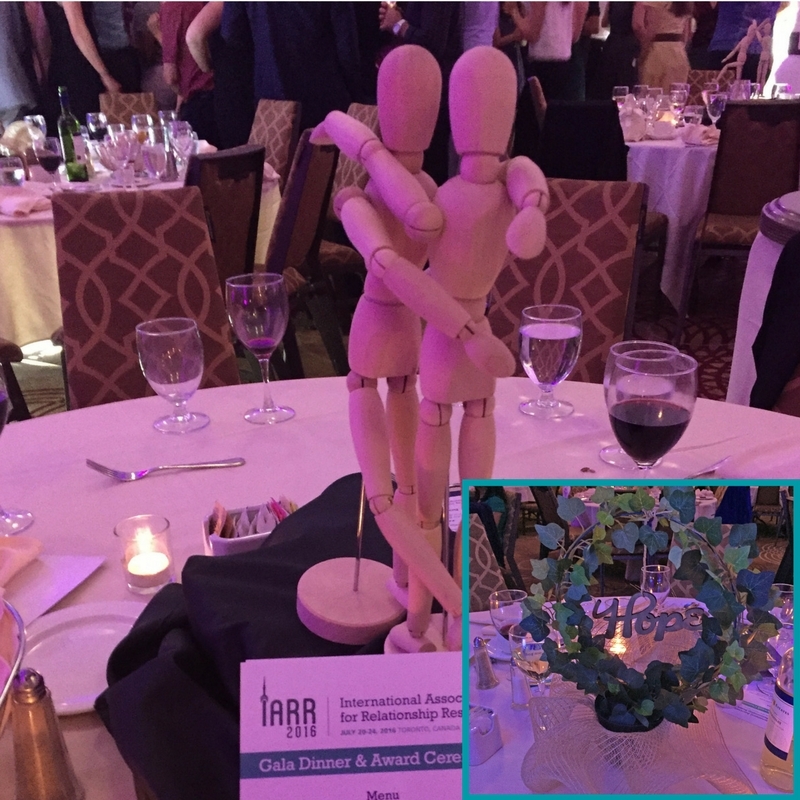 Armed with an understanding of the IARR organizing committee and a sense of fun, the ICS team chose a creative way to demonstrate the conference theme through its centerpieces rather than order conventional flowers. Half the tables were decorated with artificial potted vines displaying key words from the five-day conference, while the other half showed two small figurines in different types of relationship poses such as dancing, hugging and chasing. These centerpieces wowed and entertained delegates during their final dinner in Toronto. Needless to say, the positions of the figurines were less innocent after a wonderful evening and award speeches and hours of dancing on a packed dance floor! As part of our 40th Anniversary celebration, ICS wanted to give back to our industry. What better way to do so, then to bring world class education from our sector to our part of the world. For almost 40 years IAPCO held it's renowned Annual Seminar in Wolfsberg/Switzerland. ICS President Mathias Posch has been a Faculty member for the last few years. In 2015, the IAPCO Council made the strategic decision to expand the Seminar, move it out of Switzerland and rotate it around the world. In addition, IAPCO updated the program and introduced various levels. ICS was one of three companies to volunteer to host the first IAPCO Edge Seminars. 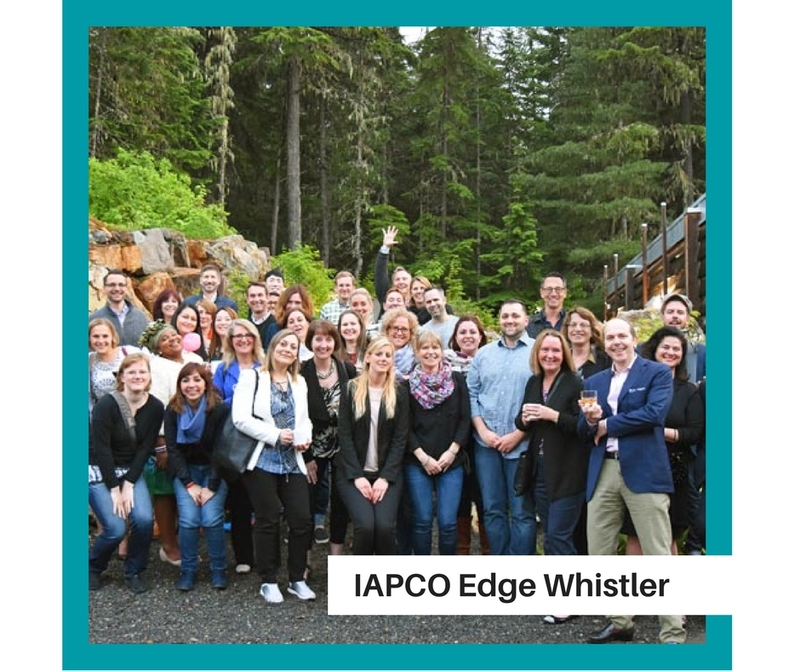 In May 2016, we hosted IAPCO Edge Whistler, a Level 2 Seminar which marks the first ever IAPCO Educational Program in North America. Our delegates came from 10 different countries and the learning was exceptional...Edge Whistler actually received the highest ever score of any IAPCO Programs, 98%! 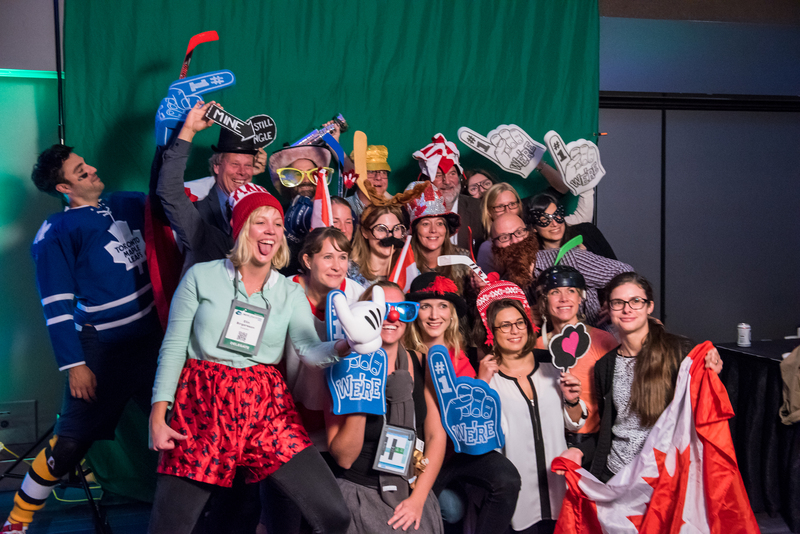 "IAPCO Edge Whistler was truly a meeting of minds, energy and people. I feel optimistic and invigorated about working in the event industry" ~ Annie Wong, Junior Conference Manager at International Conference Services Ltd. 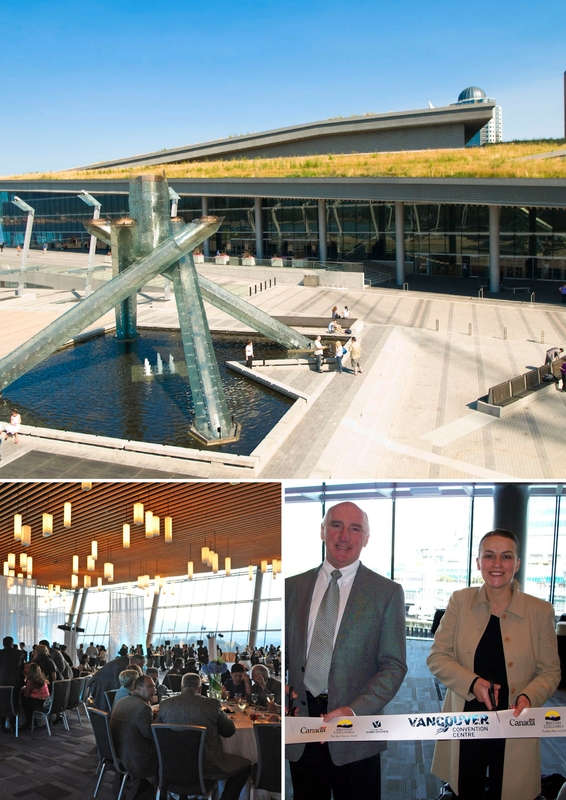 The 14th Human Proteome Organisation World Congress (HUPO 2015) hosted by ICS, took place from September 27th - 30th, 2015 in Vancouver and boasted many fun-filled moments. As mentioned, the Congress Hockey Night in Canada was a delegate favourite as was the beautiful setting of the congress venue, the Vancouver Convention Centre, which boasts views of the North Shore Mountains and Pacific Ocean. That all being said, it was one delegate in particular which stood out in many attendees' minds. This was not the typical delegate you might find at a HUPO Congress, but rather one of the K9 variety. 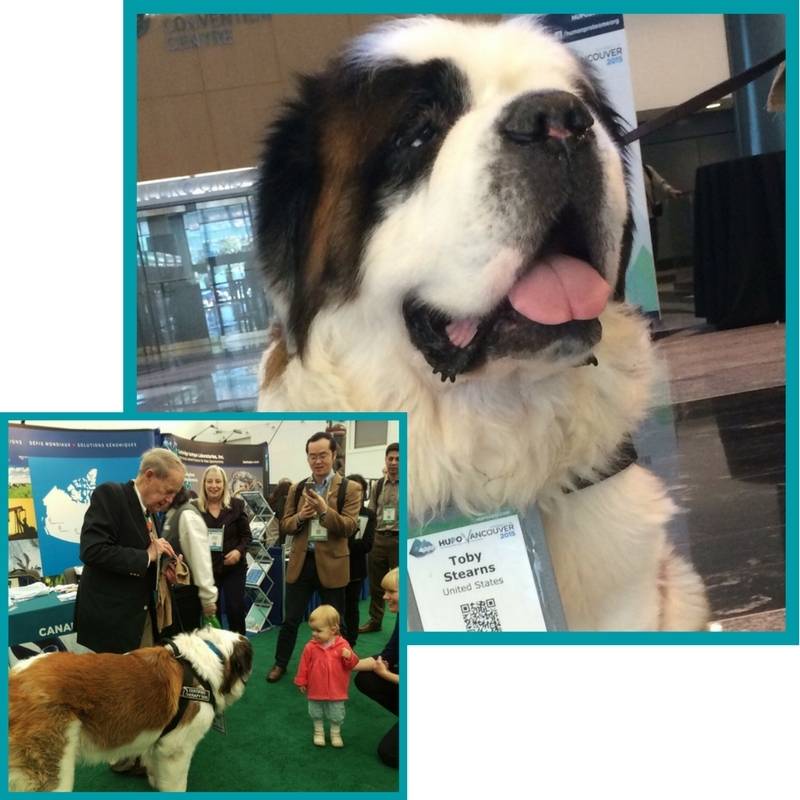 HUPO 2015 (and ICS for that matter) saw its first ever "Dog Delegate", Toby, the St. Bernard. Toby, a therapy dog and gentle giant, was a member of VICI Valco Instruments, an exhibitor at the Congress. Toby made quite the first impression and as you can see here, left a lasting impression on even the youngest of HUPO delegates! 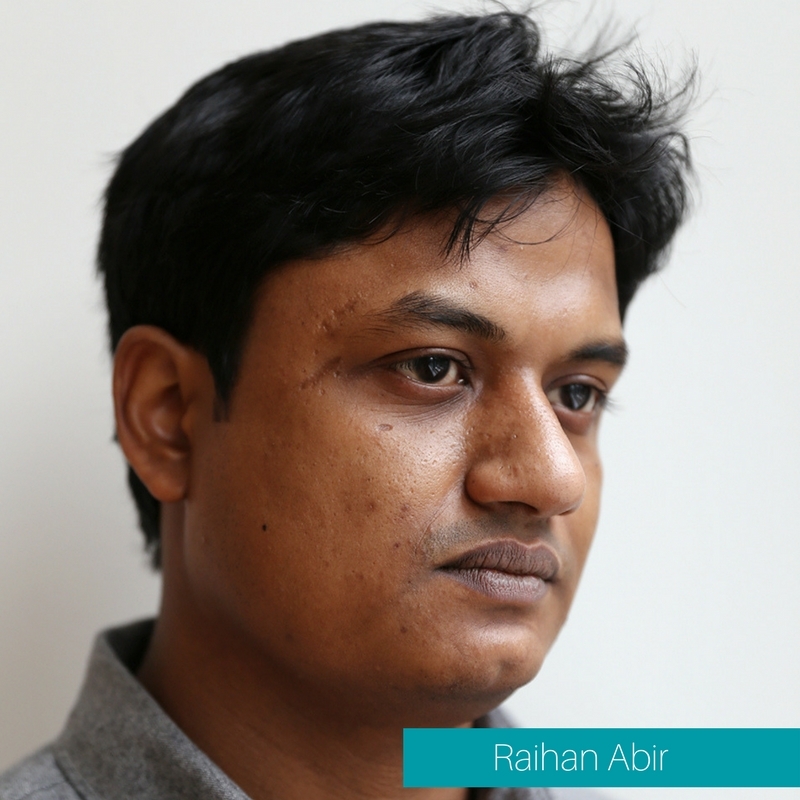 Organized by International Conference Services, the 2015 World Congress on Medical Physics & Biomedical Engineering (IUPESM 2015) created life-saving opportunities for Bagladeshi writer Raihan Abir and his wife Samia Hossain. While completing a PhD in biomedical engineering, Raihan escaped threats from extremist groups by attending IUPESM 2015 in Toronto. Following the congress, Raihan applied for asylum allowing him to sponsor Samia. The young couple and their daughter Sophie now live safely and happily in a Toronto high-rise apartment. "To me this is the greatest country in the world right now" said Raihan. For us at ICS, this was a great reminder of our responsibility to stay mindful and receptive of every delegate request that comes in. Behind every delegate registration there is a story; and potentially a life-saving opportunity. While most Congress Chairs recommend a traditional gala dinner, HUPO 2015 Congress Chair Christoph Borchers took a risk and opted for something unique - the first ever Hockey Night in Canada at the Vancouver Convention Centre. Complete with a 3,000 square foot synthetic ice rink, the East Ballrooms at the VCC were magically transformed into a unique, once in a lifetime, Canadian experience! The night began with a fun and delightful Timbit exhibition game (4 - 6 year old young Hockey Players) followed by the Canadian Anthem sung by one of our referees. The Hockey Team Challenges, where 4 teams of 8 HUPO delegates each were tasked with completing several hockey challenges, were fun to watch. One of the challenges was a team facing off against the HUPO 2015 Congress Co-Chairs in a one-on-one player versus goalie challenge, with Congress Co-Chairs Christoph Borchers & Pierre Thibault guarding the net. Delegates had the opportunity to skate on the ice rink, enjoy fun hockey activities (for example, hardest shot competition, air hockey tables and green screen), canadian foods and beverages, and a local band that rocked the night away on the stage. This was truly a memorable Congress Night that neither the delegates nor the team at ICS will forget anytime soon! On Thursday, May 14, 2015, the legendary Larry & Willy from the Larry & Willy Morning Show on CFAX and Jack FM were the Masters of Ceremonies for the BCAB Gala Dinner. Having Larry & Willy moderating the Gala Dinner was a huge moment as many of the delegates grew up listening to them on the radio. Larry Hennessey & Willy Percy had worked on the radio together for 28 years, but sadly in 2012 they went their separate ways hosting solo shows on different radio stations. One of the highlights of the night was Willy Percy's win for the Broadcast Performer of the Year for the BCAB 2014 Awards of Excellence. 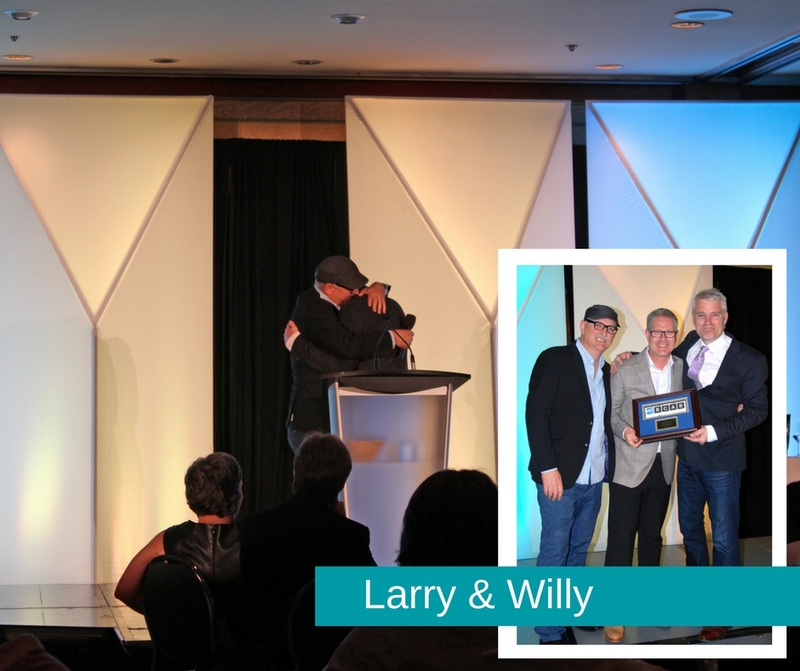 What made this award so special was the fact that Larry got to present it to Willy, who in tune was extremely stunned and overcome with emotion. The pair hugged it out for about 15 minutes all while the audience gave them a standing ovation. Willy said on the night that he could not accept the award because it belonged just as much to him as it did to Larry. What a great example of not only a long lasting work relationship, but also a lifelong friendship! All of us at ICS know how important it is to keep the culture of teamwork in our office alive and we've had some fantastic staff retreats over the years to prove it. Previous retreats include trips to Victoria, Whistler, Las Vegas, Seattle and Pasadena. 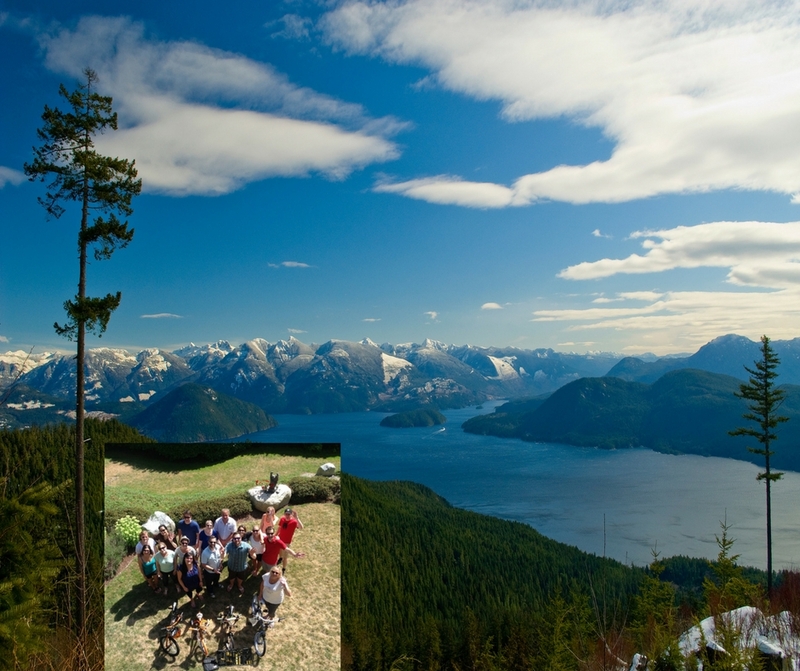 Back in 2014, the ICS team got together for a retreat at the home of ICS founder Franziska Kaltenegger on the Sunshine Coast. This was the first of what has now become a traditional ICS Summer BBQ where our team gets to know each other on a more personal level. Franziska's home and property are stunning. It provided such a relaxing atmosphere for the retreat - so much, that some members even stayed overnight! The day was filled with laughs, great food and fun team-building projects, including assembling a child's bicycle (which is not necessarily an easy task!). The bikes were then donated to children on the Sunshine Coast. Thank you Franziska, for being such an incredible member of the ICS family, and for inviting us into your beautiful home! A growing company needs growing leadership and ICS' strength comes from its people. Therefore, it was only natural for Mathias and Iain to invite some of the key team members who have contributed to the growth of the company to become business partners. Let us introduce you to our ICS partners and their stories at ICS! Grit came to ICS in 2007 as an intern with no background experience in conferences. She had been working in the hospitality industry, but this was mostly in the logistics and transportation sector. When Grit came to ICS, she was scheduled to help with Housing and Registration for the World Conference on Lung Cancer in 2007 in Seoul, Korea, but after only a couple of weeks, she was asked to take on the job of Speaker and Abstract Manager, something we all know is not an easy task! "It was an amazing experience dealing with more than 400 invited VIP Speakers, and more than 1,500 abstract presenters. It was endless hours, but it was well worth the effort. The event went by so fast that I barely remember any of it! It is all a big blur!" Grit fell in love with Vancouver and the team at ICS, and of course, the team fell in love with her too so Mathias asked Grit to stay permanently. Even though the draw to stay in Vancouver was there, Grit ultimately decided to head back to Germany. Fast forward a few months after being home in Germany, and Grit decided that she missed Vancouver and the work too much, and thus, decided to move back to Vancouver for one more year to work on WCLC 2009. After the huge success of WCLC 2009, Mathias offered Grit a position at the newly opened ICS Vienna office which she gladly accepted. Only a few months later, Mathias offered Grit the position of Conference Manager for WCLC 2011 in Amsterdam, but on one condition; she would have to move to Vancouver for good. This was an opportunity that Grit could not refuse, so with the help of ICS, she was able to get her work visa, and later on, her permanent residency. Grit moved to Vancouver in January 2011. After another huge success with WCLC in 2011, Grit was promoted to Senior Conference Manager, then in August last year, she was promoted to Director of Operations and become partner in the company. More recently, Grit is now the Chief Operating Officer at ICS. Jenn hails from Halifax, Nova Scotia, and holds a degree in Financial Management. After working in the finance industry for six years, Jenn decided to open her own business in International Events and Corporate Branding. After eight very successful years, Jenn sold her company and was hired by ICS as Director of Business Development in 2011. In 2013, she was promoted to Vice President and just this past year, to owner and partner. "In May of 2008, I began my career with ICS working alongside President & Partner Mathias Posch. Acting as Executive Assistant and Human Resources Manager until 2012, I was then approached to become Partner in our newly acquired company - Global Online Learning Discussion Ltd. (GOLD) - which develops entirely online continuing education programs for maternal-child healthcare professionals. The company rapidly expanded in size, services and popularity and so we decided to offer similar concepts we developed within GOLD to existing ICS clients as well. In 2014, I took on a secondary role as Managing Partner of the newly established WebCoast Events Inc. The company was established to further customize the technology we had been developing in GOLD for new clientele outside of the maternal-child healthcare field. Our first few projects saw us working with international medical conferences - recording their proceedings for on-demand viewing and managing the e-commerce systems for their internet-based audiences. In 2014, WebCoast Events Inc. was established as a separate entity in order to meet the growing demand from both ICS and even 'friendly competitors' to provide online education options to their clients. The company received a kickstart by leveraging services developed by another subsidiary of ICS, Global Online Learning Discussion Ltd. (GOLD) - which develops online continuing education programs exclusively for maternal-child healthcare professionals. WebCoast primarily creates and manages Webinars and Virtual Library Systems (working with existing client materials or recording physical conferences) for a variety of professional associations. Secondly, WebCoast builds Event and e-Commerce Websites, Registration Systems, develops Online Marketing Strategies and performs all Graphic Design Services for ICS Clients. We are so happy to have such a strong relationship with ICS in particular, and to work with such a diverse range of international clients! Professional highlights for our team are definitely when we head onsite with clients. This is a welcome break from our coding, designing and general techno-wizardry behind the scenes - it's so rewarding to see the delegates enjoy the experience we have helped design. ICS manages many meetings around the world and usually does not submit them for awards, but after seeing what ICS and the Local Organizers had put together for WCLC 2013, Lyn Lewis-Smith, CEO of Business Events Sydney, decided to put the conference forward for a prestigious award...and we won! 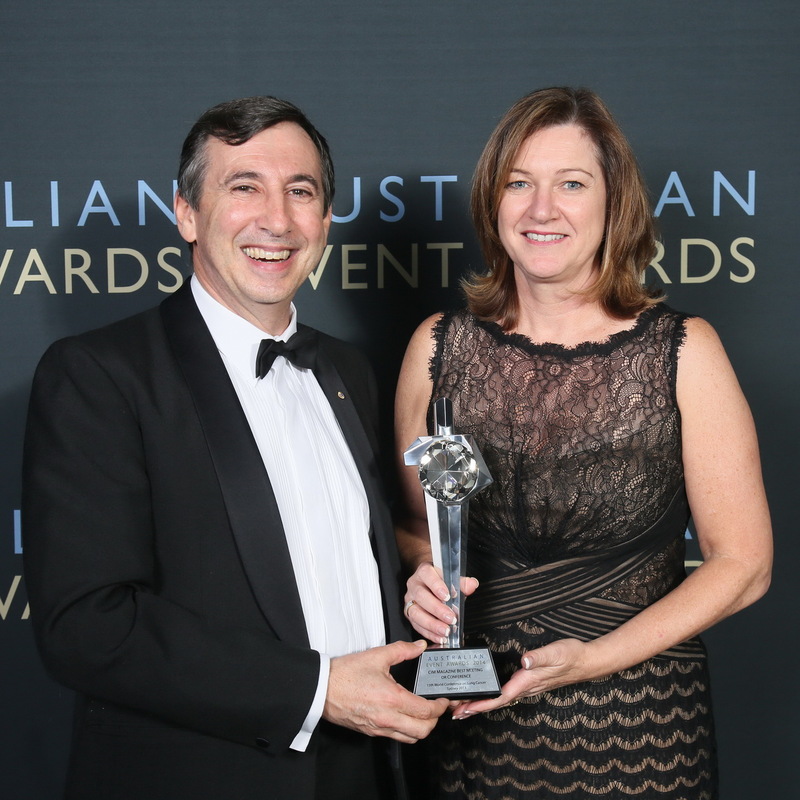 The IASLC World Conference on Lung Cancer 2013, organized by ICS, was named CIM Magazine's Best Meeting or Conference at the Australian Event Awards in 2014. Held from October 27 - 30, 2013, the conference attracted 5,331 lung cancer professionals from around the world to Sydney, Australia. The conference also posted a record 2,122 abstract submissions. The conference is hosted by the International Association for the Study of Lung Cancer (IASLC) and ICS has a long standing partnership with them. It is always such a pleasure for us to work with them. "Working with ICS and Business Events Sydney to deliver the World Conference on Lung Cancer was a great experience. It truly highlighted to me the importance of having an experienced and cohesive team to make events such as this one a success (Business Events Sydney, November 12th, 2014)." In 2011, Global Online Learning Discussion Ltd. was acquired from Health e-Learning located in Australia. Online since 2007, the first ICS-run GOLD Lactation Online Conference was held in the spring of 2012. 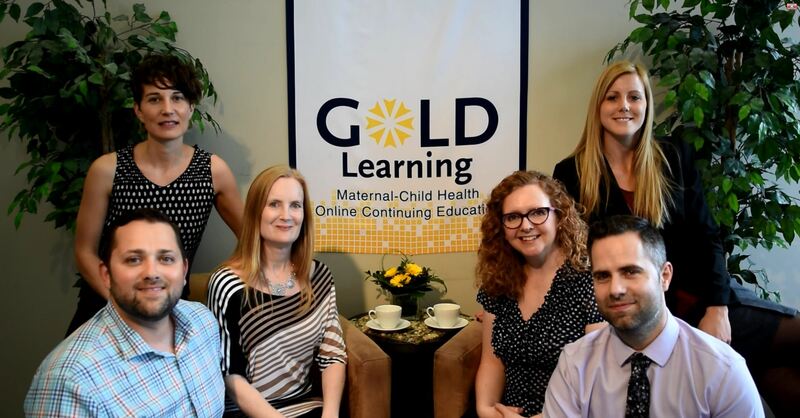 In the fall of 2013, the first GOLD Perinatal Online Conference was born and by 2015, it had expanded again with the first GOLD Midwifery Online Conference. 2015 also saw the launch of the GOLD Learning website, which is an archival host of evidence based education, largely sourced from the annual GOLD conference and industry partnerships. Since 2012, the GOLD team has grown from a two person operation to a group of ten employees and contractors and we can't wait to see how the company will continue to grow in the coming years! The letter was from my boyfriend Matt, who I thought was giving me an early present for my upcoming birthday two days later, on February 12th. When I finished reading the note there was another knock. I turned around and Matt was standing there with two champagne glasses. He walked into my office, got down on one knee and proposed. As in ICS fashion, everyone in the office was standing in the hallway watching the entire thing and cheered when I said yes. 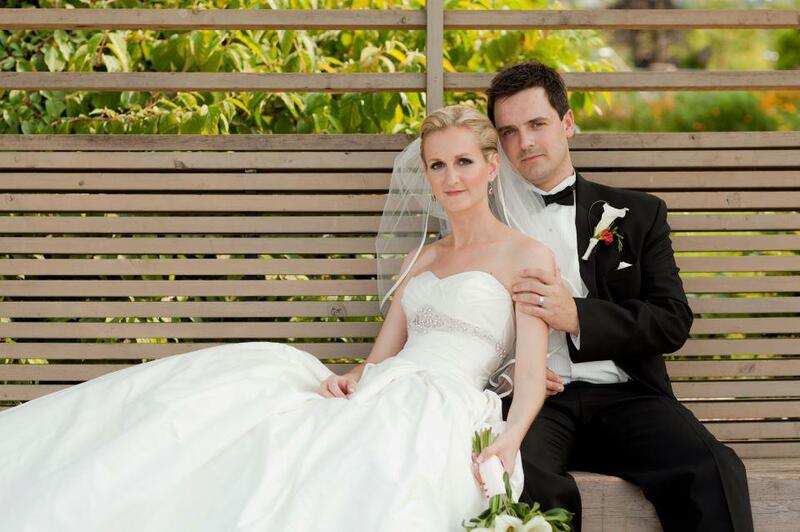 Matt and I were married on July 7, 2012. We welcomed our son, Alexander, into the family on February 16, 2015. Dr. Lawrence Einhorn has been involved in many past World Conferences on Lung Cancer and is an esteemed member of the International Association for the Study of Lung Cancer. His distinguished career took off in 1974, when he tested a drug called Cisplatin with two additional drugs that were effective in killing testis cancer cells. This combination became the cure for testicular cancer, which up until then had an overall survival rate of just 5%. With the use of these three drugs, tumors dissolved within days and shortened the duration of treatment from two years of therapy to just nine to twelve weeks. Dr. Einhorn's work now serves as a research roadmap for generations of oncologists. Dr. Einhorn has received countless honours throughout his career. He is currently a Professor of Medicine at the Indiana University School of Medicine and one of the world's most famous oncologists. Working with people like Dr. Einhorn makes our job at ICS so rewarding and fulfilling. By organizing superior conferences, ICS is helping to facilitate change in the world, so doctors like Dr. Einhorn have the opportunity to meet with like minded people to discuss advancements in the treatment of deadly diseases such as lung cancer. At ICS, we are "Connecting people to facilitate change in the world" and there isn't a more perfect example of a person who has dedicated their life to facilitating such impactful changes in our world. In 2010 and 2012, International Conference Services was appointed as the professional conference organizer for the Inter-American Breast Cancer Conference (IABCC). We were so honoured to have had the pleasure of working alongside Conference Chair Dr. Orlando E. Silva. Dr. Silva is a highly regarded physician around the world for his publication Breast Cancer: A Practical Guide, which is one of the most significant texts in the education of breast cancer to this day. In addition to his scientific accomplishments, Dr. Silva is also extremely active with various charities and foundations. In 2001, Dr Silva founded the Emmaus Medical Mission which has sponsored 43 medical missions to South America, Central America and Africa. In 2002, Dr. Silva also founded Silva's Army, a community of thousands of people focused on patient advocacy, education and fundraising, for the American Cancer Society and other cancer fighting initiatives. Among many of his incredible accomplishments, Dr. Silva was the recipient of the Outstanding Hispanic Award at the Americano's First Annual Hispanic Forum, held in Washington, DC in 2010, and the Hispanic Philanthropist Leader Award by Philantroguia in Miami at Northern Trust Bank in 2014. ICS has been so inspired by Dr. Silva's incredible work that ICS has supported his foundation Misioneros del Camino on several occasions. Dr. Silva is now based out of the new Cancer Center at Larking Community Hospital in South Miami, Florida, and we are so honoured to have had the opportunity to work with someone who has made such an impact on the lives of millions living with Breast Cancer. ICS is honoured to work with many outstanding professionals and individuals who are striving towards changing the world. We have formalized our business purpose to "Connecting people to facilitate change in the world" and as big of a purpose as that sounds, our clients have proven to us time and time again that this is exactly what we are doing, together. Here we are spotlighting three clients that are representing all of the great people who have had the privilege to work with, or who we will be working with in the near future - that truly make huge changes in our world. ICS is honoured to be working with Dr. Frances Shepherd who is the IASLC 19th World Conference on Lung Cancer 2018 Honorary Chair which will take place in Toronto. Dr. Frances Shepherd is a longstanding member and past president of the International Association for the Study of Lung Cancer and has been a frequent Speaker at many WCLC conferences in the past. Dr. Shepherd is one of Princess Margaret Cancer Centre's top medical oncologists who was recently named Officer of the Order of Canada, a distinguished honour along with many other exceptional high-achieving Canadians. Dr. Shepherd has been recognized for her leadership in improving treatments for individuals who are living with advanced lung cancer. Throughout her esteemed career, Dr. Shepherd has acquired a lengthy list of achievements including the O. Harold Warwick prize for her contributions to Cancer Control in Canada, the Order of Ontario, the Premier's Summit Award for Medical Research, the British Thoracic Oncology Group International Award for Contributions to Lung Cancer and the Claude Jacquillat Award from the International Congress on Anti-Cancer treatment. She has also been an investigator in more than 100 clinical trials and has co-authored dozens of articles for medical journals. 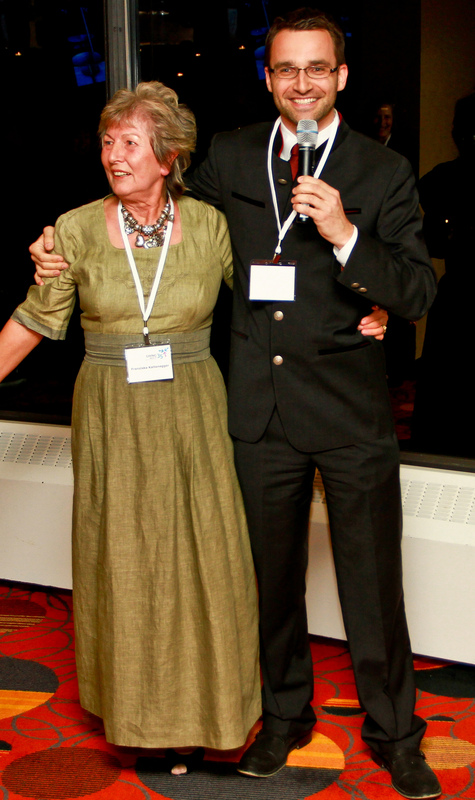 ICS managed the International Congress of the Transplantation Society (TTS) in Vancouver in 2010. This was the first large conference held in the new Convention Centre, and ICS had the privilege of participating in the Ribbon Cutting Ceremony with Congress Chair Dr. Paul Keown. A piece of that ribbon is framed at the ICS office in Vancouver and we are proud to have been a strong partner of the Vancouver Convention Centre ever since. Previous to the development of the new Vancouver Convention Centre, the Vancouver Tourism Industry had been advocating for an overall expansion of the convention centre for many years. When Vancouver won the Olympic Games in 2010, the funds were finally released to build this world class new facility called "VCC West". The expansion of the VCC has been an incredible success story and probably one of the best uses of any of the Olympic venues. The centre has also opened Vancouver up to host countless meetings that it was not able to host before. Some of these include events managed by ICS like FIGO and IDF. Not only has the new VCC put us on the map as an international conference destination, it has also been a powerful economic driver for the city of Vancouver. TTS was a very successful congress, attracting nearly 5,000 delegates to the city. The VCC was the perfect venue that combined beautiful architecture and design with the unmatched service of a world class staff. When International Conference Services was created in 1976, most meetings were organized locally. 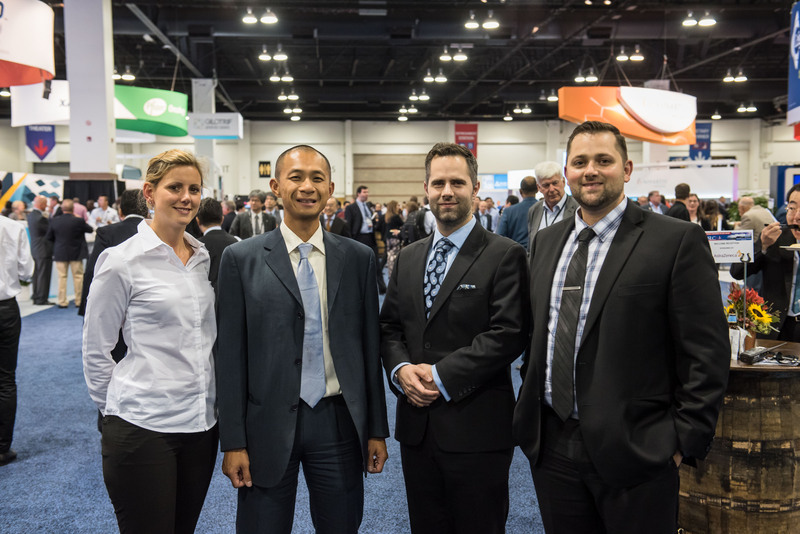 Steady changes in the industry lead by improvements in technology increased opportunities for ICS to manage conferences across Canada and around the world. In the past 7 years, ICS has opened five branches to support its national and international growth. ICS had a great reputation with international associations and a large number of them are headquartered in Europe. The branches have brought ICS closer to those important European clients. Due to strong industry ties in the Austrian market, ICS opened its first European branch in Vienna in 2010. That same year, it opened a branch in Denver, followed by a second Canadian branch in Toronto. 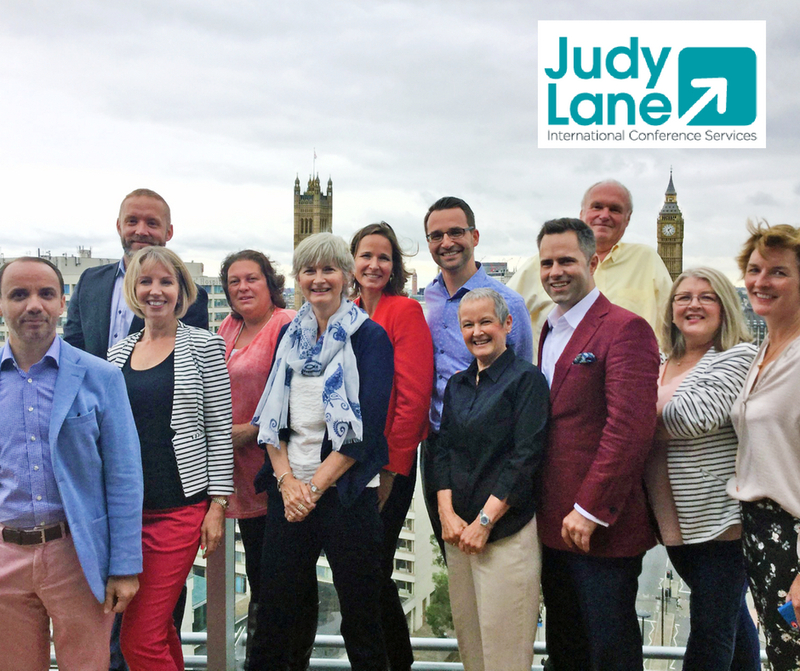 The recent merge with Judy Lane Consulting in July 2016 was an excellent fit for both companies and created additional branches in two of the top global meeting destinations in Europe - London and Barcelona. ICS is focused on integrating these new teams into the ICS culture and growing the offices. ICS has always grown organically. It capitalizes on any opportunity that supports the overall Business Plan and makes efficient use of company resources. 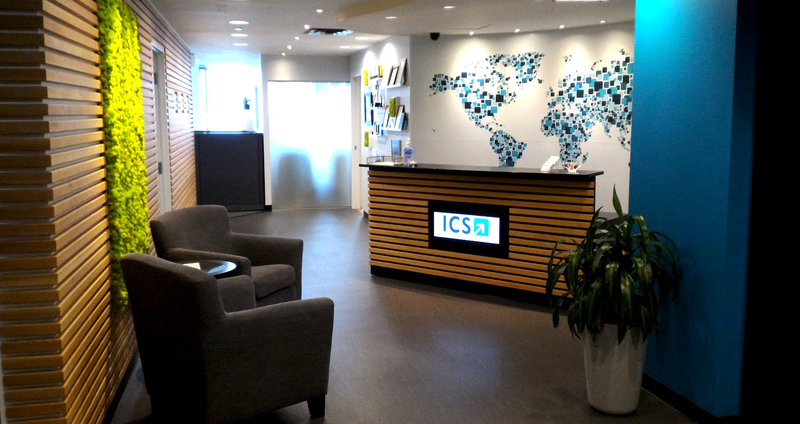 At ICS, branches work closely with the Vancouver headquarters. Everyone works together on projects and interacts on a daily basis. At ICS, branch offices to not work independently, but are part of the greater ICS family. In June 2009, ICS acquired the Education and Career Fairs (ECF) to expand its client base and promote Co-operative Education opportunities for high school students in British Columbia. 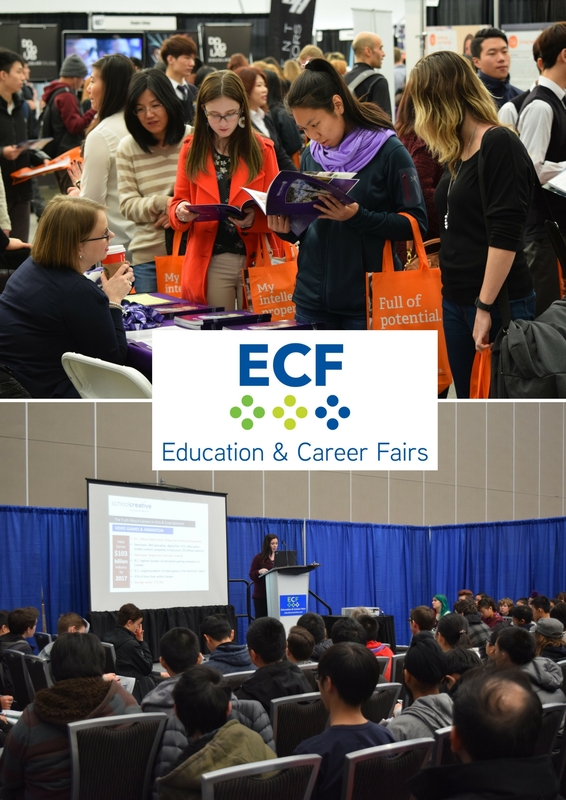 ECF provides students in Abbotsford, Kelowna, Kamloops, Nanaimo and Vancouver with a platform to connect with businesses for work and study opportunities at home and abroad. ICS believes great employees are the foundation for a successful company, and this begins with youth. ECF carries the noble cause of providing young B.C. residents with guidance for their future careers, therefore, ECF was a perfect addition to the company's offering. By 2015, ECF grew to attract over 11,000 attendees. ECF celebrates its 20th anniversary this year with a fresh look, and is proudly recognized by Business in Vancouver as one of the "Top 10 Tradeshows" in Metro Vancouver in 2015 and 2016 (by attendance). The ECF team at ICS is proud to announce the re-launch of their website. To take a look, or to learn more about the 2017 Education and Career Fairs, please click here. 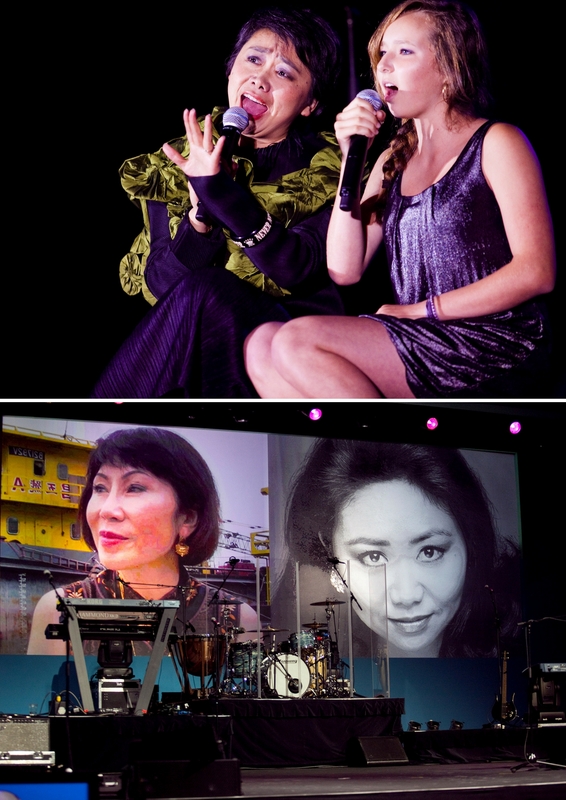 At the Gala Dinner of the World Conference on Lung Cancer in 2009 in San Francisco, California, USA, delegates were mesmerized by a performance with one of the star sopranos of the San Francisco Opera - Zheng Cao. She entered the stage, a passionate and powerful singer, set to deliver a breathtaking performance from the Opera Carmen. The audience - doctors and professionals from the Lung Cancer field - loved her and gave a standing ovation. She then turned to the audience and told them her story: She was diagnosed with stage 4 lung cancer and that one of the members of the Local Organizing Committee was her treating physician. She wanted to thank the people in the room as she felt that her doctor was her anchor. For them, she sang the song "You Never Walk Alone". There wasn't a dry eye in the room. For the grand finale, she sang "Somewhere Over the Rainbow" in a duet with the daughter of Conference Co-Chair David Jablons. It was one of the most emotional experiences of any of our conferences and delegates still talk about it today. The ICS Team got to know Zheng Cao very well and she was one of the warmest people we ever worked with. We hugged her good-bye with a heavy heart after the Conference. Her treatments were successful for a while and things looked up but sadly Zheng Cao passed away in early 2013. We will never forget the special evening she provided for our delegates and for all of us. 10. The Beach Boys Rock the House! It's not everyday that conference delegates get to experience a performance by The Beach Boys (yes, the actual Beach Boys!). At the World Conference on Lung Cancer in 2009 in San Francisco, California, USA, this was just the case, as this world famous band took to the stage after the Gala Dinner, and let's be honest, what's more Californian than The Beach Boys! Françoise, our social event planner extraordinaire, was responsible for securing The Beach Boys for this conference. To say that it provided a memorable "Wow Factor" for the conference delegates would be nothing short of an understatement. The WCLC delegates had a fantastic time, revelling in in some of The Beach Boys' most famous hits. Some of the delegates even took to dancing on their chairs, and at one point, even the tables! Françoise said of The Beach Boys, "They were all extremely professional, super approachable and down to earth." Carl Wilson, an original member of The Beach Boys, sadly passed away after a battle with Lung Cancer in 1998, so performing for a group of medical professionals working to eradicate Lung Cancer was very special for them, too. 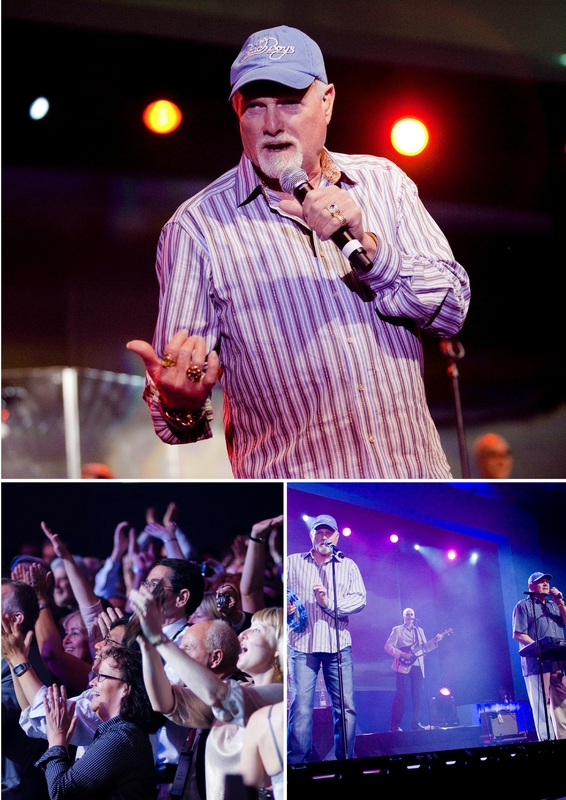 When WCLC returned to the USA in 2015, the ICS team from Denver matched The Beach Boys performance with the equally impressive Kool and the Gang! "I first met Franziska, the previous owner and president of ICS, at the IAPCO General Assembly in February 2006 in Mexico City. We chatted and instantly connected as we were both Austrian. Franziska soon asked me to come to Vancouver to take over the management of ICS but I declined as I was happy where I was. Shortly after, Franziska "tricked" me into coming to Vancouver for some "relaxing days" after a meeting we managed in Toronto in September 2006. This is where I met Iain. Franziska arranged a lunch at the Vancouver Club where I would meet her business partner, Iain Mackay and where they offered me the position of Managing Directer at ICS. I was so surprised that I asked for some time to consider. I decided to accept the offer to join ICS on a balcony in Rhodes, Greece, about a month later, with a bottle of red wine and my good friend and later Manager of ICS Europe, Inge Tremmel. We were in Greece for the ICCA Congress. Franziska was downstairs in the hotel bar with Christine Mackay, Iain's daughter. I went down to tell her the good news and we celebrated there and then. I arrived in Vancouver in March 2007 and was thrown right in as Managing Director. Franziska departed shortly after and I took over as President. On January 1, 2008, Iain made me partner." Unbeknownst to Franziska, Iain, and Mathias; the Vancouver Club - where their initial meeting took place, would also be the hosting venue for our 40th Anniversary party which took place last year! Franziska first met Iain MacKay, present Chairman of the Board for ICS, through one of her girlfriends. Gisela Maskell. Gisela had just sold her travel agency to Iain's wife, when Franziska was considering selling her own company. Gisela recommended that Franziska get in touch with Iain as she thought he might be interested in buying her company. A few weeks later, Franziska and Iain met over coffee and they found themselves getting along extremely well and exchanging financial and procedural information about ICS. Franziska's dedication and hard work had built ICS into a leader in the events industry and Iain knew that this was an opportunity he could not pass up. Within just three months, Franziska sold her company to Iain. It was agreed that Franziska would stay on for two more years (three days per week), allowing Iain sufficient time to find a replacement. However, Franziska ended up staying longer, as it was a near impossible task for Iain to find a replacement with Franziska's knowledge and expertise. Little did Iain know that Franziska secretly had someone in mind and had already started her subtle recruitment process. 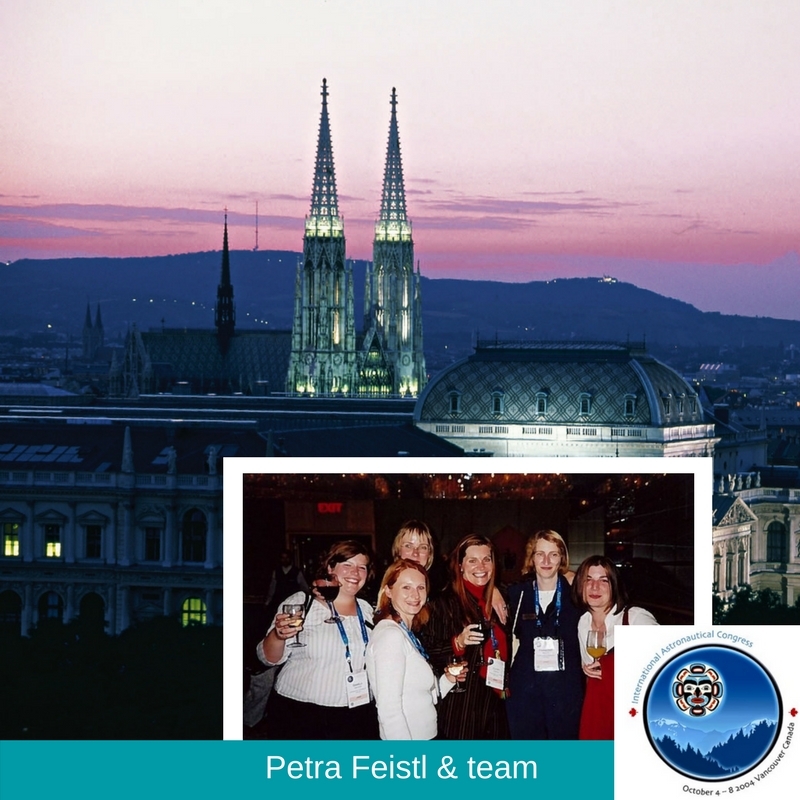 Petra Feistl, Senior Conference Manager in our Vienna Office, had always wanted to combine her passion for travelling with her work. So, the decision to complete her Master's Degree in Tourism and Leisure Time Management in Austria was an easy one. Her love for organizing conferences was finally anchored during her internship at ICS in 2004, and from this point on she knew that being in this fascinating industry was the right path for her. ICS takes pride in our dedicated internship programs which have allowed dozens of people the opportunity to begin their careers. Many of our past interns still work here today or have gone on to do fantastic things in the industry. During her internship, Petra worked in the Registration & Housing department closely with Françoise and two other interns from Germany. Her main project was the European Space Agency (ESA) Congress in Vancouver. The Congress saw approximately 5,000 delegates! "This Congress was my greatest learning experience. It was my first truly international Congress and everything that comes with it. There was a great sense of teamwork, working late hours and enjoying the occasional pizza party! I have to say a huge thank you to Françoise and the Congress Managers from back then, as they really allowed us interns to learn how a huge Congress like this is organized and it really taught me the importance of internal team communication." To this day, Petra keeps in touch with the two other interns, and they have a great friendship. She also still has one of her staff t-shirts to serve as a reminder of her very first, and hugely successful Congress. After some thoughtful consideration, and even though Petra loved Vancouver she decided to move back to Vienna. While working for a Professional Conference Organizer in Vienna, in fact, the same PCO where Mathias, our now president, was working at the time, Petra spent four years managing various medical Congresses and events. This made Petra appreciate the importance of being well organized, detail oriented and enthusiastic about your work. A fun fact: Petra was actually interviewed for this position by Mathias, and she was his last hire before he moved over to ICS! After gaining further experience in communications and administration from an international company for several years, Petra decided it was time to "go back to her roots" and joined the ICS team in Vienna in 2016. She is so excited to be a part of the ICS team again, and is looking forward to many exciting events to come! ICS managed the International Bar Association's (IBA) social program back in 1998 including an optional dinner for delegates to attend - but there was a problem; as there was a lack of indoor venues that could facilitate such a sizeable group in the city. So, Franziska using her creative and imaginative flair, suggested to host the event under a tent at Spanish Banks. With the local mountains and the Pacific Ocean as a natural backdrop, this was the perfect location for a truly "Canadian BBQ Experience". The event included checkered tablecloths, drinks, a huge BBQ and line dancing which, to the surprise of everyone, saw the IBA President - usually a very serious man - letting loose on the dance floor! Just recently, ICS has integrated Judy Lane Consulting into the ICS family, which to this date, is still managing the International Bar Association's events. 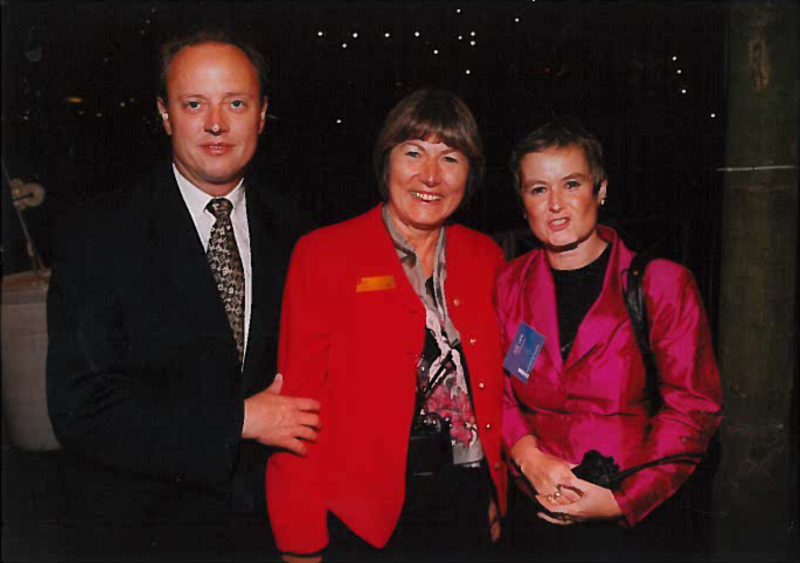 As you can see in this picture of Franziska and Judy Lane back in 1998, our story of working with Judy Lane has now come full circle. International Conference Services managed the World Conference on Lung Cancer (WCLC) for the very first time in 2003, which also marks the year that our longstanding relationship with the International Association for the Study of Lung Cancer (IASLC) really began. To this day, WCLC 2003 Conference Chair Dr. Nevin Murray remains a great friend of ICS and Franziska, and IASLC is one of ICS' most important clients. Overall, this conference was hugely successful allowing the association to grow. 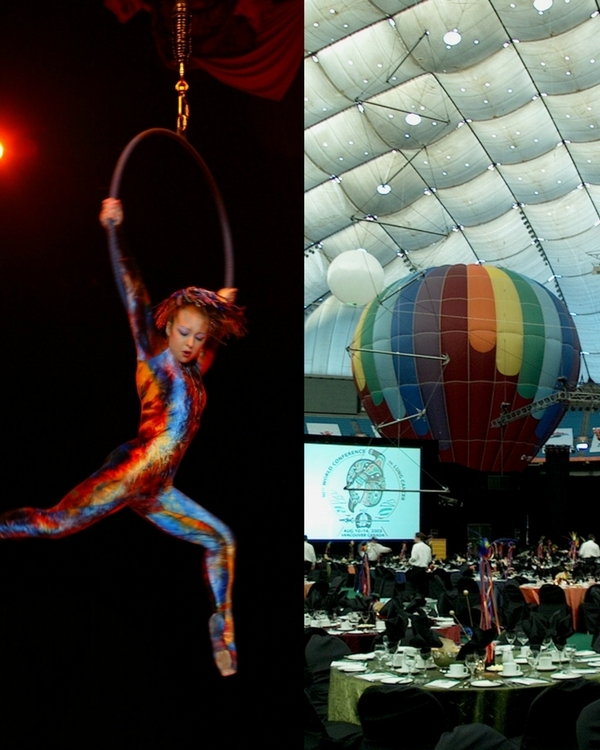 The social program included a magnificent performance by Cirque du Soleil and a hot air balloon in BC Place during the Gala dinner evening! International Conference Services' President Franziska Kaltenegger was featured in WestCoast Magazine. The article highlighted ICS and former president Franziska's views on ICS' philosophy, on launching a business and what she thought about the future of the events industry. The article was not only a spotlight on our company, but also a fantastic feature on Franziska as a strong and dedicated woman spearheading ICS. 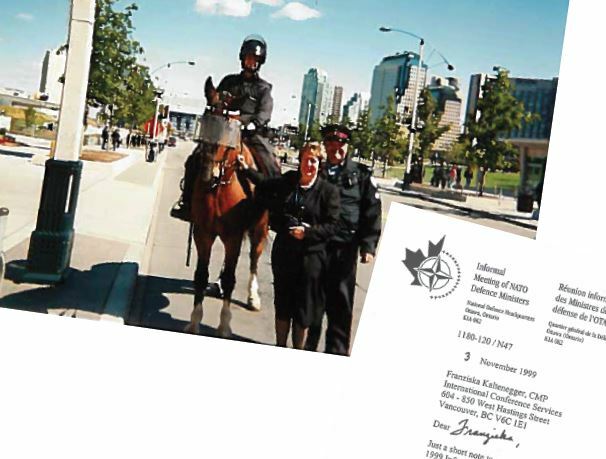 In 1999, International Conference Services had the opportunity to work on the Informal Meeting of NATO Defence Ministers which was held in Toronto. 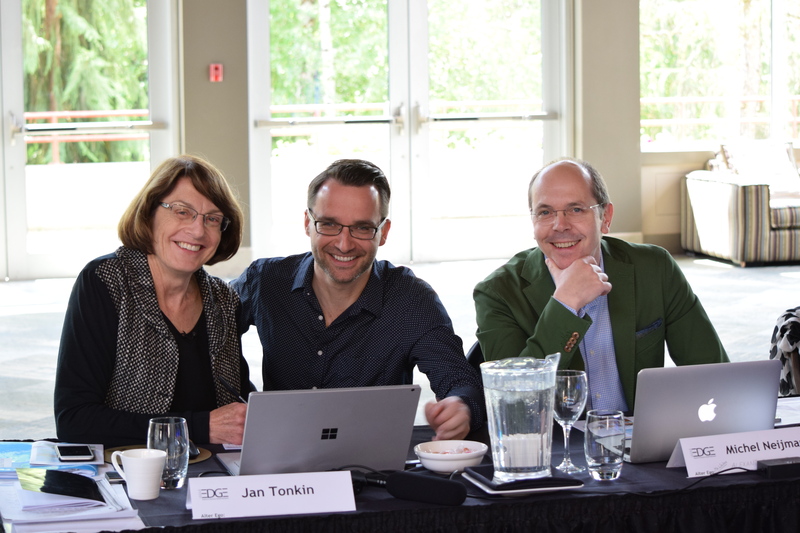 The ICS team, including Franziska and Sandy Biback, built an incredibly strong and trustworthy relationship with the committee even though they had very little lead time to prepare for the actual meeting. ICS greatly contributed to making the event a huge success. So much so, that both Franziska and Sandy received thank you letters from Bob Corley, of the National Defence Headquarters. One million dollars was needed to produce this conference. To do so, Franziska knew that pharmaceutical sponsorship would be key. Determined, she set out on her plan to win as much sponsorship as she could. To backtrack a little bit, Franziska had never tried to secure sponsorship for any of her past conferences. She asked her client to introduce her to the head of the sales department at a pharmaceutical company, trying to utilize his connections as best as she could to ensure this conference's overall success. Franziska, along with her client, met the above mentioned sales department head for lunch. She was determined to come out of that meeting with a very substantial amount of sponsorship. Her client, on the other hand, was weary of asking for such a large sum of money and throughout the lunch, he simply avoided asking his pharmaceutical friend for any sponsorship at all! During the lunch, Franziska politely "nudged" her client under the table to kindly remind him of why they were in fact having lunch with this Pharmaceutical representative. When some more time passed and Franziska's client still did not ask the most important question and she realized she would have to be the one to do so. When the pharmaceutical representative got up to use the restroom, Franziska and her client decided that if they wanted the sponsorship, Franziska would have to ask for it herself. Expecting the pharmaceutical representative to say no, Franziska and her client were both pleasantly surprised when he agreed without hesitation to sponsor the event. He even hinted that he would have been happy to provide them with even more money than what they had asked for! Since then, ICS has delivered great sponsorship results for numerous conferences taking place not only in Vancouver, but all around the world. ...While working at the Hyatt Hotel in Vancouver, Franziska Kaltenegger came across an opportunity to buy a small company. Owning her own business was always something that she had intended to do, so she asked an industry friend to take a leap with her and buy this company. Together, they purchased the company in 1976 and called it CanWest. 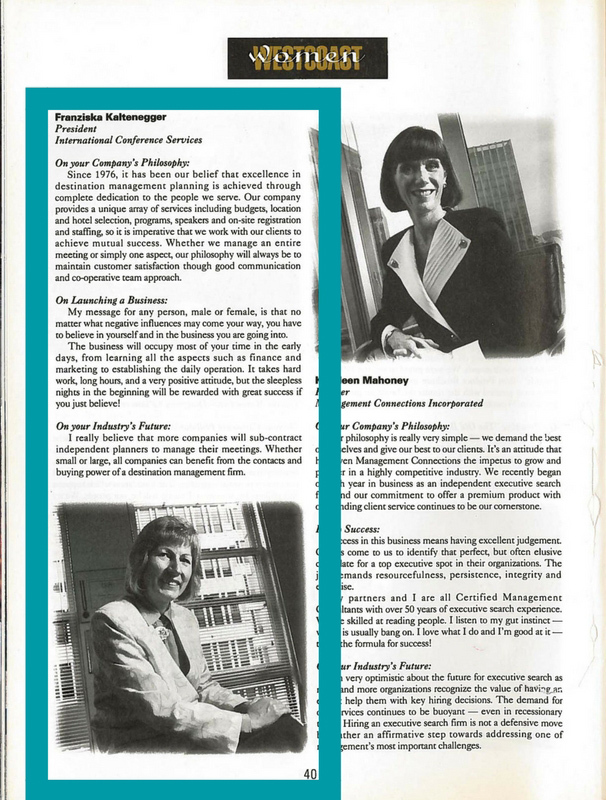 Two years passed, and in 1978, Franziska's partner made the decision to begin a family, and thus, Franziska, packed with determination, imagination and drive, decided to keep her company going and push further into the events industry, rebranding CanWest into what we all know today as International Conference Services Ltd. (ICS). In the early stages of ICS, one of Franziska's friends who worked for Air Canada suggested that she extend her event management services into the world of conferences. In particular, conferences from Europe, an idea which would eventually serve to propel ICS to not only national, but international recognition. By expanding ICS services from corporate, incentive and destination management into conferences, Franziska was better able to plan for her company's future. By going after and winning conference proposals, Franziska could be strategic about how many events she would need to manage each year, in order to ensure ICS' continued success. Franziska's determination to succeed has laid the building blocks for how ICS is run today. ICS has been responsible for putting on some amazing conferences all around the world (some of which will be featured here), and all of us at ICS are so appreciative of her guidance and support throughout the years.